Strollers/Walkers come in a range of models designed to suit your requirements. The slide show shows a small example of what is available. Options of accessories like trays, oxygen holders are also available. 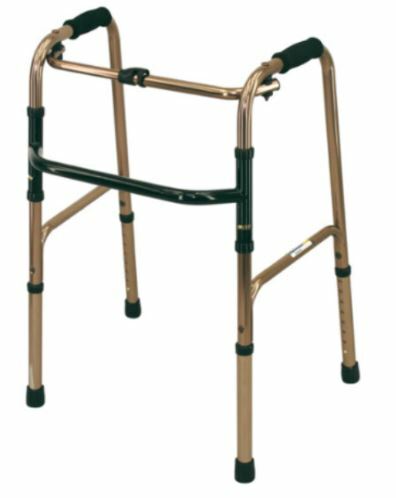 Walking frames are designed for those persons with limited balance and provide a stable . If you have difficulty balancing or you're at risk of falling, a walker can make it easier for you to get around — whether you use the walker temporarily or as a permanent aid. If stability is a significant concern, you might choose a standard walker without wheels — which you must pick up to move. Many people, however, choose between two-wheel and four-wheel walkers. A two-wheel walker allows you to place weight on the walker as you move. The legs with wheels allow you to easily push the walker forward, and the legs without wheels prevent the walker from rolling while you're stepping forward. ​If you don't need to lean on the walker for balance, you might be able to walk faster with a four-wheel walker. Most walkers come with plastic grips, but you have other choices as well. You might consider foam grips or soft grip covers, especially if your hands tend to get sweaty. ​If you have trouble grasping with your fingers — secondary to arthritis, other joint pains or nerve problems in your fingers — you might prefer a larger grip. Choosing the correct grip will relieve unnecessary stress on your joints and help prevent joint deformities. Whichever grip you choose, be sure it's secure so that it won't slip while you're using the walker.